﻿ Real Madrid 7-1 Celta Vigo. Ronaldo gets the job done! 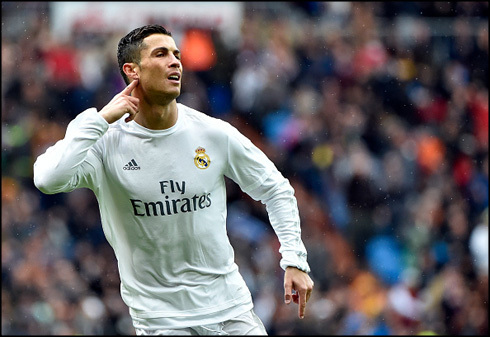 05.03.2016 » Real Madrid 7-1 Celta Vigo. Ronaldo gets the job done! 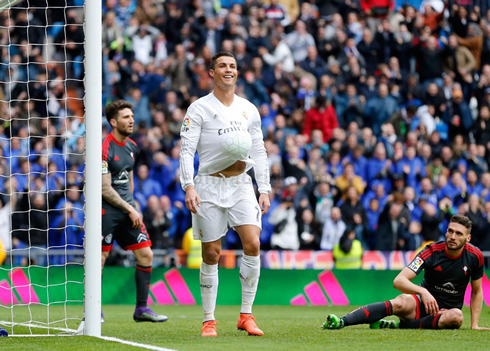 Real Madrid ran over Celta de Vigo in a 7-1 win this Saturday afternoon at the Bernabéu, with Cristiano Ronaldo leading the troops after scoring another poker of goals. The Merengues showed no mercy against a very disorganized side and earned a great motivation boost ahead of their next clash for the Champions League against AS Roma. Real Madrid fans have been left speechless many times this season but this time, it was for a good reason. A massive statement from Los Blancos and in particular Cristiano Ronaldo, who bagged four goals in the second half, as Madrid romped to a 7-1 victory over 6th placed Celta Vigo. Ronaldo, Jesé, Bale and an opening goal from Pepe was enough for Madrid as they left the pitch in high spirits ahead of a very important matchup with Roma, in the Champions League next week. Despite the second half flurry, the first half was a far more even game as both teams had chances, yet struggled to put anything away. A header from Pepe right before the half, however, put Madrid ahead at the break. In the second half, all hell broke loose and Cristiano Ronaldo was naturally the star who shined the most. A brilliant strike from outside the box hit the roof of the net and soon after, a vintage freekick put Madrid 3-0 up. Both goals were reminiscent of Ronaldo at his best and given all the criticism he's received this season, it was a sight for sore eyes. Ronaldo peeled off in celebration pointing to his ears, as if to say "I can't hear you now." A lack of focus would allow Celta to grab one back, with Iago Aspas finishing with a beautiful chip over Navas. However, that would only be a brief respite between Real Madrid's goalscoring run. 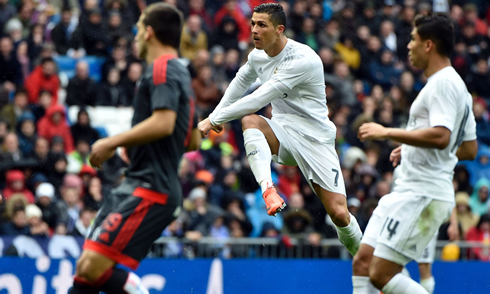 Ronaldo would finish off his hat trick with a tidy finish inside the six-yard box after some brilliant build-up play. Shortly after, Jesé Rodríguez would get his first off the bench, after energetically taking the ball from his opponent, running into the box and finishing well. Ronaldo wasn't done either, his header from a corner hit the back of the net for his fourth goal. It was also his 27th goal of the season, putting him ahead of FC Barcelona's Luis Suarez as the top scorer in La Liga. Substitute Gareth Bale, back from his injury layoff, finished off the festivities with a typical long range effort near the death. It was a superb game and it was a joy to see Madrid back playing the type of football that the fans want and that the team is capable of. Looking ahead, the likes of Casemiro and Kovacic need to see more game time. 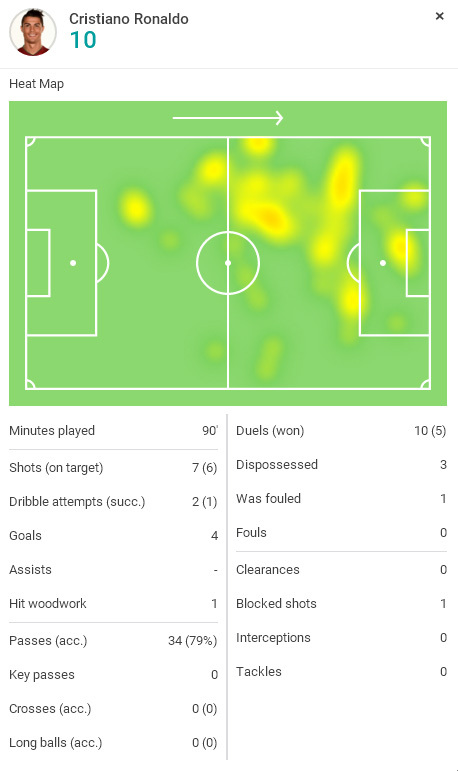 The Brazilian in particular was excellent marshalling the midfield and giving Madrid the type of defensive presence they so badly need. And of course, Cristiano Ronaldo being back to his best is only good news. Attackers: Cristiano Ronaldo, Borja Mayoral. Cristiano Ronaldo next game with Real Madrid for the UEFA Champions League is on the 8th of March of 2016, against AS Roma. You can watch Juventus live stream, the Real Madrid vs Roma, Eibar vs Barcelona, WBA vs Manchester United, Crystal Palace vs Liverpool, and Hamburger vs Hertha Berlin, all matches provided from our live streaming football game pages.